Pressure to change continues to build on companies that use an R22 refrigeration system for their day-to-day running. The key to a smooth transition lies with project management – how to remove the R22 refrigerant and professionally install a replacement system. The majority of R22 refrigeration units are at least one-third of the way through their foreseeable life. As existing systems start to require modernisation, the majority of companies are choosing to phase them out rather than go to the expense of repairing or maintaining them. As well as being far more efficient, new refrigerant R410A poses no threat to the ozone layer. 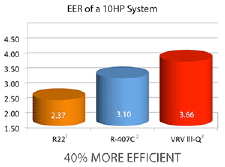 In addition, due to significant improvements in heat pump technology, a new R410A inverter air conditioning system could deliver up to 30% great efficiency (or more) than older R22 equipment. Increased efficiency means less energy consumption, lower energy costs and lower CO2 emissions. Most companies affected by R22 legislation will have a policy to specify only the following environmentally friendly refrigerants in new equipment: ammonia, R404A, R407c and R410A. The chosen alternative is decided at business unit level and is usually dependent upon how the equipment will be used and how energy efficient it needs to be. For older Daikin VRV and non-Daikin VRF systems, VRV-Q allows you to upgrade the outdoor unit to a Heat Pump VRV-Q, which can deliver 50% lower running costs than an older R22 system. The Enhanced Capital Allowance (ECA) scheme is a key part of the Government’s programme to manage climate change and is designed to encourage businesses to invest in energy saving equipment. It provides businesses with enhanced tax relief for investment in equipment that meets published energy saving criteria. What are the R22 replacement options? Using a drop-in refrigerant may seem like a simple answer. However, this short-term solution comes with an increased risk of system failure, higher running costs and without the backing of a manufacturer’s warranty for any replacement part failures. Instead, Daikin and a host of other manufacturers offer a complete range of R22 replacement options that are easily installed and much more energy efficient. R22 replacement solutions are available that provide cost-effective and highly energy efficient upgrades for existing R22 systems. Yet their installed cost could be up to 50% lower than installing a new system. A range of R22 replacement options is available. So plan for change now to manage budgets and integrate upgrades into planned building works. Some manufacturers will continue to supply a small amount of spare parts for systems originally sold as R22. The legislation relates to the gas not the equipment. To support systems using drop-in refrigerants, parts can still be purchased, however please note that no parts warranty will be offered.